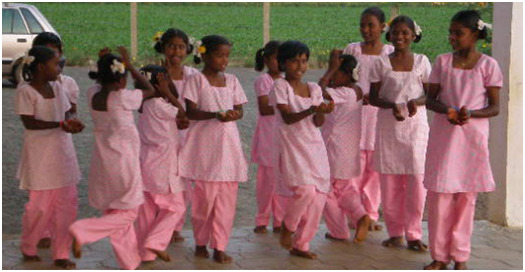 AimforSevaBayArea – Sponsor a child. Transform a life. Take the child to the finish line. AIM for Seva achieves TOP 4-star rating for Third Year! We are proud to announce that AIM for Seva USA has been awarded a four star rating for the third consecutive year by Charity Navigator, an independent external validating non-profit organization, for demonstrating strong financial health and commitment to accountability and transparency. In the USA, there are about 1.2 million charities out of which about 8000 organizations get qualified to be evaluated by Charity Navigator every year. Only 24% of these have scored the TOP rating (four out of four stars) for three consecutive years. This achievement by AIM for Seva means that we outperform most charities in our area of work, and demonstrates exceeding of industry standards. “This exceptional designation from Charity Navigator sets AIM for Seva apart from its peers and demonstrates to the public its trustworthiness.” says Charity Navigators’s CEO, Mr. Michael Thatcher. We could not have received this four star rating without you! Thank you for your donations, your time, and your good will. Your trust and support means a lot to us! Apasara, the celestial dancers, occupy a major space in Indian mythology. The temple dancers, the court dancers and other professional dancers of the past consider themselves the incarnations of the Apsaras. They have the privilege of knowing the sixty-four Kalas. They are the Vidyadharis. Through the narrations of a temple dancer, who acts like a Sutradhar, we attempt to capture the life and the artistic vision and the inner domain of the women dancers of India, from past to present. Please visit this site periodically to get updates to this Event, and learn about the progress on AIM-S activities for the year. I would like to give you a year-end report on how your financial help directly helped in transforming the lives of hundreds of disadvantaged children from remote villages throughout India. The primary vision of the All India Movement for Seva is for people helping people directly, and not relying on institutions. Only then it can become a mass movement. We even select the managers of the students hostels based on their local ties, passion and empathy for those they serve. The sage advice by Swami Dayananda, who started the movement was this: Be assured that both the contributor and the recipient are blessed. Also, to support your own offspring is good and natural; even birds and animals do it. To support someone else’s offspring is extraordinary, truly human and divine. We thank you for being a part of the movement. You may support many excellent charities. All the more the reason that we value your trust in AIM for Seva’s ability to run an efficient organization, and manage steady growth organically. I am happy to report that you in the Bay Area provided the leadership in financial help in all of US. You donated over $340k in 2018, including a commitment for a massive new complex in Madhya Pradesh, the support for all the hostels we had direct responsibility for, and still have funds for other hostels. There are also early plans for some new hostels sponsored by Bay Area people. This is more than we expected, and we thank you. 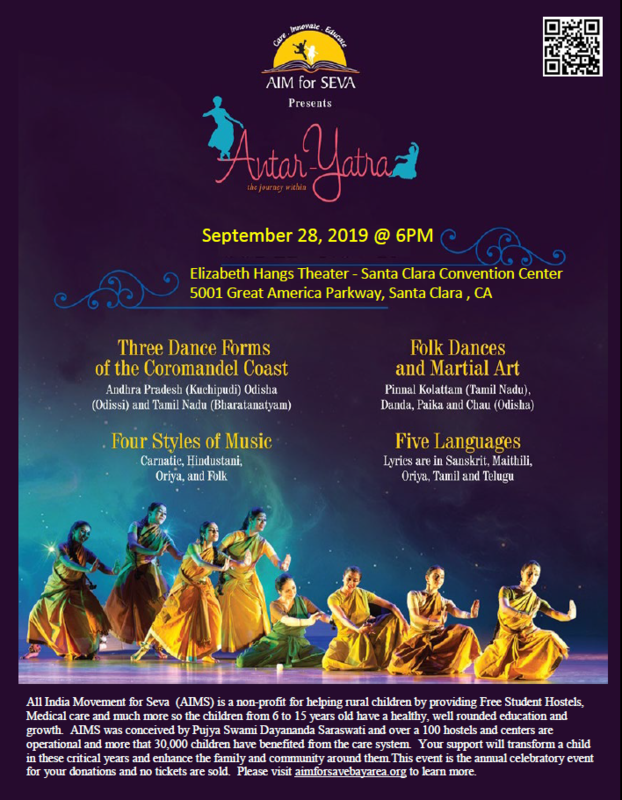 Finally, please mark your calendar: on Saturday, September 28, 2019 we will have our annual excellent cultural show, called Antar-yatra to thank our donors. This has received rave reviews, and you will not want to miss it. With a $100K donation, drive the construction of a new facility and change the lives of a village and district around it. Shortlist of possible sites with great need have already been identified. All detailed logistics and procedures will be handled by well organized teams, to make the process easy. See this Page for more details. Please see here for more details about the composition, location and updates of these FSH here. Longer term endowments are highly appreciated. Online Credit card donations can be done using the link above.. Checks payable to “AIM for Seva” can be posted to this address. Thank you for your continuing support for this worthy cause. If you can help in any volunteer capacity, please send an email to sudharsana.srinivasan@gmail.com for inquiries.